Jesse E. Houghton married Lettie (?) in circa 1894 age 29 and 30; mar 16 y in 1910 census. Carl Houghton married Ella (?) in circa 1895 mar 5 years in 1900 census. Burial Haughton Cemetery, Toledo, OH, USA, He was the last Haughton buried there. John H. C. Haughton married Sarah J. Wood. Sarah J. Wood married John H. C. Haughton. Mary Ann Craver married Lester J. Haughton, son of Alonzo Haughton and Abigail Ensign, in Jan 12, 1875 at Trumbull Co., OH, USA. Alonzo Haughton married Abigail Ensign in Oct 19, 1838 at Hartford, CT, USA. Lyman R. Haughton married Mary Mahan in 1875 at Waterville, Lucas Co., OH, USA. 1870 Census 1870 Southington, Trumbull Co., OH, USA, age 32, a farmer, property $17,775-1000; next door to brother Henry A.
Marcus Bosworth Haughton married Prudence Hess in Nov 4, 1860 at Bristolville/Farmington?, Trumbull Co., OH, USA. 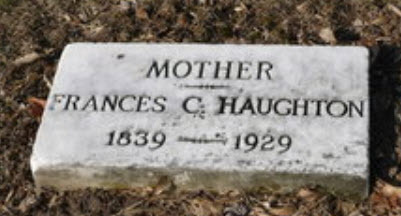 Prudence Hess married Marcus Bosworth Haughton, son of Samuel Haughton and Amanda Osborn, in Nov 4, 1860 at Bristolville/Farmington?, Trumbull Co., OH, USA. Lilly May Haughton married Eugene Harvey Joy in Nov 20, 1890 at Southington, Trumbull Co., OH, USA. Ernest Merle Haughton married Nina Maud Thorpe in Dec 25, 1901 at Southington, Trumbull Co., OH, USA. Elma Coresta Haughton married Edwin Otis Baxter in Dec 16, 1896. Frank Rosco Haughton married Nora S. Pierce, daughter of Alva Pierce and Jane (?). Frances Caroline Bush married Nathaniel Haughton, son of Lyman Haughton and Keren Happuck Woolverton, in Aug 3, 1863 at Lucas Co., OH, USA. Harry Bush Haughton married Anna M. Rees in Sep 11, 1899 at Detroit, MI, USA. 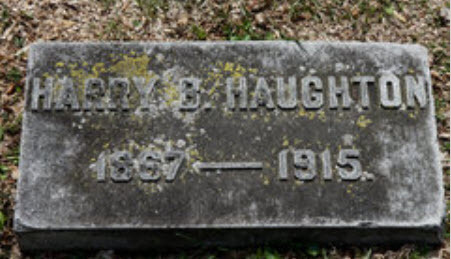 Harry Bush Haughton married Frances D. Lockhart in circa 1904 Mar 6 y in 1910 census.